MVRemix: What are your thoughts when coming to Vancouver? Tech N9ne: Vancouver means a whole lot of fans. It means a lot of family that I’ve made in the past times that I’ve been here, and it means a wild, wild, crazy show. That’s why I’m getting so much love, because everybody’s so wild in Vancouver. I can’t wait. I’ve been having people calling me since the tour started like, “You got us on the list?” “You got us on the list?” Yes I do. It’s gonna be massive, they said The Vogue is pretty big and I’m thinking we might fill it up man, we’ll see. MVRemix: You had two dates in Victoria, how did that go? Tech N9ne: That’s why my voice sounds like this (a little croaky) because you really can’t do two Tech N9ne shows in one day because it’s so loud and boisterous, but we did it in Victoria. Oh my god, it was so wonderful. The first show was all the young kids, I mean there was 3 year olds man, with Tech N9ne shirts on that they made! I felt like they all came to see the Muppets making it happen, it was so crazy how young they were. The first show was at five o’clock with all the youngsters. The second show was 19 and over, and they were both equally bananas. MVRemix: Who has served as an influence to your live shows? Which artists have influenced the way you perform? Tech N9ne: Influenced? Public Enemy, NWA, KRS One, Run DMC, LL Cool J. You know, Eric B & Rakim. The old school taught me how to do a show. Heavy D taught me how to command a crowd and crowd participation; I paid attention. I’ve been in the crowd with some of these guys on stage, all nice and smooth. I was lucky enough to see them then and all those shows. Even Ice-T, he knew how to do a show when he came to town. The old school is what taught me. MVRemix: Are there any Kansas artists that shaped the way you perform live? 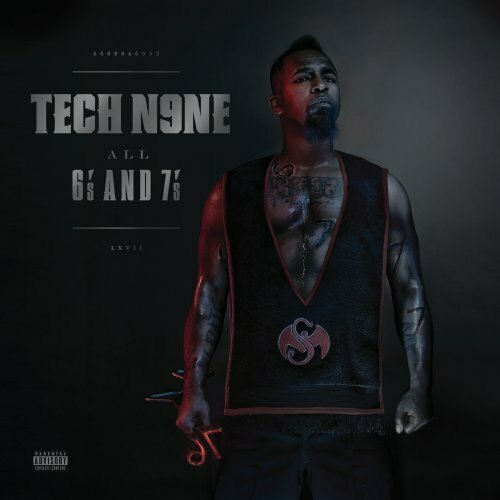 Tech N9ne: Yeah, there’s one guy. His name is Jay Lee. No, there were two guys, Jay Lee and DJ Cutfast. They were in a group with a guy named DJ Icy Rock, who did a lot of music for me in the past. They were in a crew called Straight Funk. Jay Lee taught me how to look at people in the eyes when I rapped, ’cause before I couldn’t do it, I was pretty shy. Like Jim Morrison (of the Doors) I wanted to turn my back to the crowd. But Jay Lee made it to where I looked at people, eye contact, let them know you’re there. DJ Cutfast taught me how to be energetic on stage and play with the crowd, that same clique taught me a lot back then. MVRemix: How long did the album “6’s and 7’s” take to record? Tech N9ne: I have no idea. [chuckles] I know that’s a weird answer but I actually have no idea of an actual timeframe because I get the beats and I start to write my life… Probably a month and a half. Maybe. I don’t know. MVRemix: How many songs would you say were left off of the album? Tech N9ne: Left off of the album? None. I chose 31 beats, there’s 24 selections on the album. Then Best Buy has three, iTunes has four… I did a lot of music for this album. I didn’t leave nothin’ off. I still have a couple more when I get home that I have to record for iTunes. If I’m not mistaken, I have six more in the batch that didn’t get touched. They have ideas and everything and I cannot use them for the next album ’cause my taste will be different. So I can’t wait to record the rest of them. MVRemix: When you first started Strange Music, did you have it with the idea that you wanted the company to couple with one of the majors? Or was it always that you wanted Strange Music to be independently done? Tech N9ne: Well I’ve been with the majors first before I had my independent label. I’ve been with Quest/Warner with Quincy Jones, I’ve been with Perspective Records with Jimmy Jam/Terry Lewis, I’ve been on Jcor/Interscope – I’ve done all that and it didn’t work. As soon as I started doing it independently it started working, why would I even want them anymore? We are the major label now. MVRemix: With regards to alcohol, I saw you talking a lot about KCT – is that your favourite drink, or do you have another drink of preference? Tech N9ne: That’s my drink of choice right now, KCT, Hennessy spiked Lemon. I also have a drink called Cariboo Lou which is really humungous amongst the college crowd and stuff like that. It’s [Bacardi] 151, Malibu rum and pineapple juice and yeah, those are my two leisure drinks. MVRemix: How did you initially hook up with Lil’ Wayne? Tech N9ne: Wayne did an interview from inside Rikers Island with Funkmaster Flex. Flex asked him who he’d like to work with, who would be on his wish list and he said Andre 3000 of OutKast and Tech N9ne. I was like, “Wow”, I had no idea. Just shortly after that I visited him in Rikers Island for 3 hours. We talked and we kicked it. When he came out, I came down to Miami and we did a song for his album (The Carter IV) and then we did a song for my album (6’s and 7’s). Wonderful days. MVRemix: Does it surprise you that Strange Music has gotten so far just by concentrating on the local scene and it has spiraled into all these other different areas? MVRemix: So you thought back at the middle-end of the 90’s that Hip Hop would be as big as it is today? Tech N9ne: Totally. I know because poverty will always be there always be black markets. Hip Hop is from the streets, it’s forever, real talk. It is forever, there’s no way to get around that. When you look around, Hip Hop is rock, Hip Hop is country, Hip Hop is pop, it’s jazz, it’s everything. There’s no way around it. It has merged with every piece of music, now with dubstep. If you don’t believe me and hear Hip Hop is country, if it was not there would be no Kid Rock. There would be no Nelly and Tim McGraw song, there wouldn’t be a Jazz thing with Guru (Jazzmatazz) if it wasn’t merged with Jazz…. There wouldn’t be “Walk This Way” with Aerosmith and Run DMC. It just keeps going and going. Yes, I always thought it would be here, it’s just the old timers that thought it would just be a flash in the pan. But it’s not going nowhere, so they’ve gotta deal with it. Tech N9ne: I’m a warrior, so… [ponders] I would like to get all the way in shape and see if I could take a punch from Mike Tyson. MVRemix: Do you think you could? Tech N9ne: I think my head is strong enough, but I don’t know if my chin is. MVRemix: Is there anything else you’re working on aside from “6’s and 7’s” at the moment? Tech N9ne: No, just working on pleasing my fans by traveling to do 82 shows in 85 days. MVRemix: Any songs that you’re sick of performing? Songs that the fans want to hear but you yourself want to give it a bit of a rest for a while, but you still have to perform that one? Tech N9ne: No, I haven’t gotten to that point yet. I think it’s a blessing for them to like any song that’s just made from nothing. So when I’m in the midst of doing my serious songs and they’re singing, “Oooh, areola! Oooh, areola!” my joke song, it’s funny to me. I’m not tired of doing it yet. Tech N9ne: I want them to read this and hear me say, “Together we are a powerful force, as one mind, body and soul. Let no evil enter or attempt to reduce us because of the beliefs we hold. With this love, combined with our strengths, we ward off pain and stress. Technician I am, wholeheartedly in life, and in death.